ALL GREEN IS PLEASED TO ANNOUNCE THAT OUR COMPANY HAS RECEIVED "NOTICE OF ALLOWANCE" FOR OUR PATENT, MEANING OUR PATENT HAS BEEN APPROVED! AGR technology has the most environmentally sustainable way to extract Gold, Silver, Palladium and Platinum from circuit boards. Using no harsh chemicals with our patent pending cyanide free technology along with our trade secrets. WE HAVE CHANGED THE WAY CIRCUIT BOARDS ARE PROCESSED GLOBALLY. ALL GREEN's Precious Metals Recovery and Refinery operations will operate as a newly formed division and will be independently operated from All Green Recycling, Inc.
AGR has developed its own intellectual property (IP); patent pending technology, which extracts the valuable commodities (e.g. gold, silver, palladium, platinum and copper). In our recently opened North Carolina plant, gold bearing IC chips, connectors, and other precious metal bearing components are concentrated and the precious metals are recovered by separating them from circuit boards. The photo above shows a circuit board after processing results. The patent pending process by which AGR depopulates precious metal eliminates harsh acids to produce a "concentrate" of amalgamated metals within a closed loop environment. Another unique aspect of the AGR's value proposition is the process is completed in USA without air emissions and any discharge. All Green's closed loop precious metal recovery process is easily scalable; multiple plants could successfully be created in both in US and International locations. As it pertains to the many processes used to recover scarce resources from retired electronics, the methods are often referred to collectively as "urban mining." One thing of note about the urban mining processes, is the concentration of precious metals in circuit boards is substantially higher than the virgin (as in unrefined) ore processed in traditional mining operations. All Green Precious Metal recovery has complete control of the precious metals recovery from the circuit board to the end pure gold and silver extraction. The precious metal bearing "concentrate” or metals amalgam contains Gold Silver Palladium and Platinum is generated from the All Green proprietary process and then further refined in our own in house refinery. Our recovery of gold is "Conflict Free Green Gold" and it's "Made in the USA". AGR has developed and owns 100% of its intellectual property (IP), patent pending technology, and trade secrets which extract valuable commodities (e.g. gold, silver, palladium, platinum and copper) from scrap circuit boards. 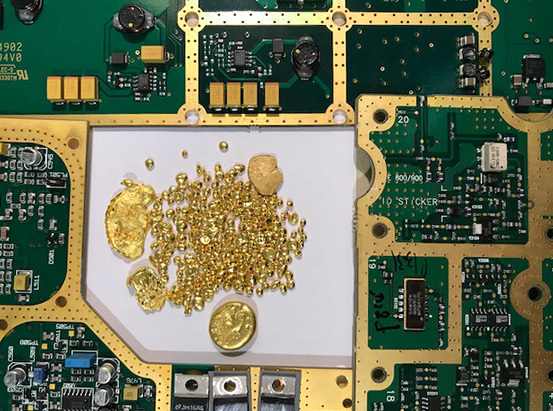 In our recently opened our North Carolina plant, gold bearing IC chips, connectors and other precious metal bearing components are concentrated and the precious metals are recovered after removing them from circuit boards. We then refine our output into .99-.999 "conflict free” Gold, and Silver in our facility. Establishing our own end to end internal capability to recover precious metals increases profits and reduces cycle time or "time-to-cash”. Our Gold and Silver output is sold regularly and paid for upon delivery. The company is producing "conflict free" gold that is 99% pure. The company is operating our own refining process. 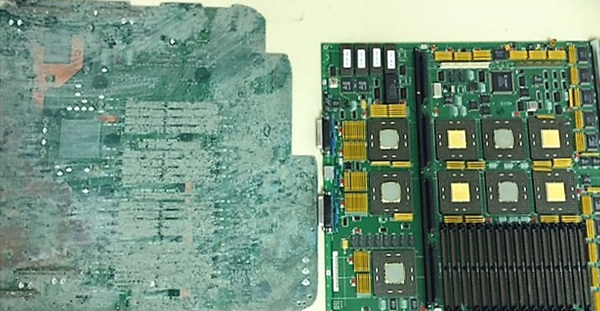 The depopulation of circuit boards consists of our proprietary, environmentally safe alkaline hydro-metallurgical process that extracts the circuit boards' various high value precious metals including the Palladium and Platinum The green board includes copper and is recovered by a copper refiner. Above is the circuit board before and after processing. All precious metal components are removed. AGR has developed its own IP, patent pending technologies and trade secrets that will provide an environmentally sustainable alternative to the current industry standard supply chain to process, smelt and refine precious metals from retired electronics. The standard currently involves collectors, agents, secondary refiners and, eventually, one of the primary smelters in Europe or Asia. AGR provides the opportunity to establish a vertically integrated, scalable process. All Green provides an environmentally safer way to process circuit boards. AGR's process enables the recovery of the precious metals from circuit boards in house without smelting overseas. The company's process also eliminates many layers of middle men, by taking the process from start to finish in house. The AGR Foundation was created to give back to the communities we serve. The AGR Foundation, (www.AGRFoundation.org), is a 501(c) 3 created to train and hire individuals with barriers to employment in all aspects of the e-Waste industry. Numerous individuals have completed the training and have found jobs within All Green Recycling Inc. and other companies in the Charlotte area. AGR Foundation has been successful in having individuals and corporations donate old equipment for this cause and help realize the vision and commitment to the community where they live and work. © 2019 All Green Precious Metal Recovery. All Rights Reserved.